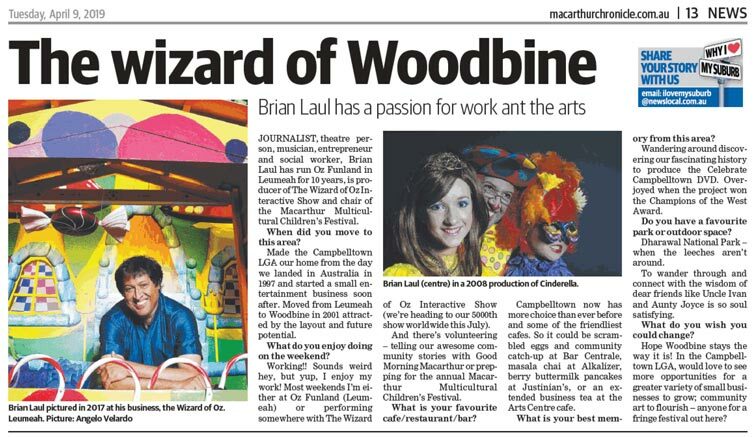 JOURNALIST, theatre person, musician, entrepreneur and social worker, Brian Laul has run Oz Funland in Leumeah for 10 years, is producer of The Wizard of Oz Interactive Show and chair of the Macarthur Multicultural Children’s Festival. When did you move to this area? Made the Campbelltown LGA our home from the day we landed in Australia in 1997 and started a small entertainment business soon after. Moved from Leumeah to Woodbine in 2001 attracted by the layout and future potential. Working!! Sounds weird hey, but yup, I enjoy my work! Most weekends I’m either at Oz Funland (Leumeah) or performing somewhere with The Wizard of Oz Interactive Show (we’re heading to our 5000th show worldwide this July). And there’s volunteering – telling our awesome community stories with Good Morning Macarthur or prepping for the annual Macarthur Multicultural Children’s Festival. What is your favourite cafe/restaurant/bar? Campbelltown now has more choice than ever before and some of the friendliest cafes. So it could be scrambled eggs and community catch-up at Bar Centrale, masala chai at Alkalizer, berry buttermilk pancakes at Justinian’s, or an extended business tea at the Arts Centre cafe. What is your best memory from this area? Wandering around discovering our fascinating history to produce the Celebrate Campbelltown DVD. Overjoyed when the project won the Champions of the West Award. Do you have a favourite park or outdoor space? Dharawal National Park – when the leeches aren’t around. To wander through and connect with the wisdom of dear friends like Uncle Ivan and Aunty Joyce is so soul satisfying. Hope Woodbine stays the way it is! In the Campbelltown LGA, would love to see more opportunities for a greater variety of small businesses to grow; community art to flourish › anyone for a fringe festival out here?